George Smoot expended a great deal of time, resources and manpower developing corrugated horn antennas with special properties (E and H plane beam equalization) that were quite unnecessary for his experiment. In the process, he got so distracted that he made a fatal error. These antennas did not have enough collecting aperture, so that his sky observations were buried in the noise. His sky map was a marginal blur, if that. The whole experiment was a mindless waste. Just to get a feel for it, Smoot’s 90 GHz horn for collecting cosmic radiation was about the size and the shape of a sadhu’s chilam. Although the Smoot and the Mather antennas operate on different principles, we can still compare the collecting apertures. When the COBE Satellite had to be redesigned (because it could not fly in a roomy space shuttle bay as originally planned but had to go on the nose of a Delta rocket), space on the satellite became extremely tight – as John Mather strenuously pointed out. Certainly, Mather’s antenna was not overdesigned with respect to the collecting aperture – certainly not towards the lower frequencies. So why do his and Smoot’s antennas – directed at exactly the same application and intended to corroborate one another, have so different collecting apertures? If Smoot’s chilam could do the job, why did Mather use a trumpet in such tight quarters? 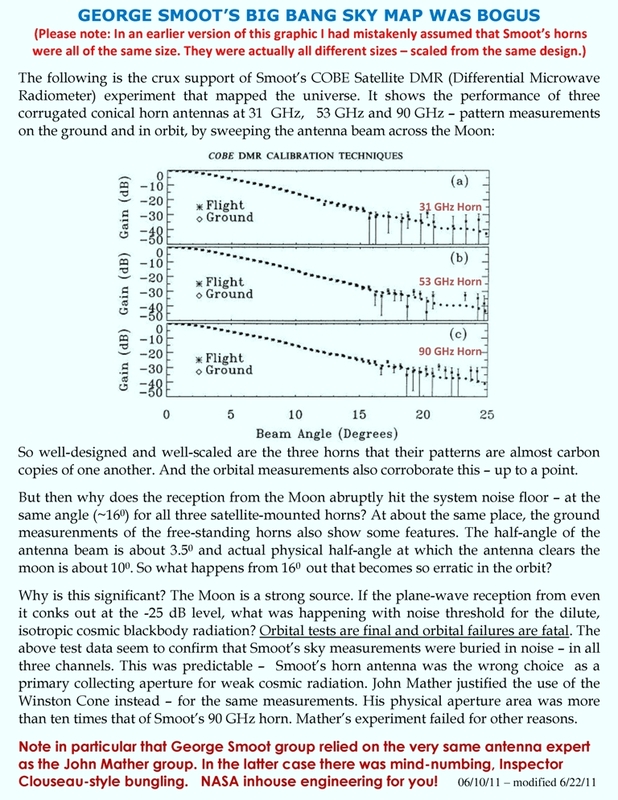 This entry was posted on June 10, 2011 at 8:46 am and is filed under Advancing physics in the Age of Fakery, NASA's COBE Satellite fraud, Nobel Physics discoveries disappearing. You can follow any responses to this entry through the RSS 2.0 feed. You can leave a response, or trackback from your own site.